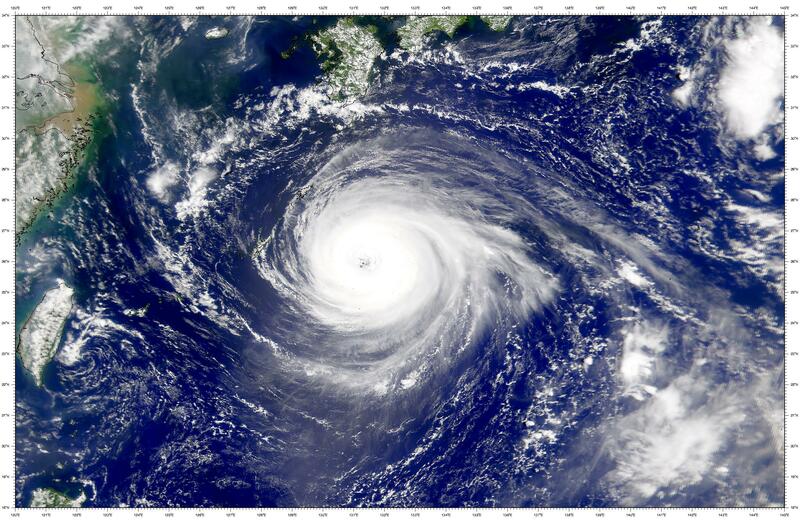 What is the difference between a hurricane, a typhoon and a tropical cyclone ? The terms hurricane and typhoon are regionally specific names for a strong tropical cyclone. A tropical cyclone is the generic term for a low-pressure system over tropical or sub-tropical waters with organised convection (i.e. thunderstorm activity) and definite cyclonic surface wind circulation. A cyclonic circulation rotates counter-clockwise on the northern hemisphere and clockwiser on the southern hemisphere. An anti-cyclonic circulation would rotate in opposite directions. Tropical cyclones with maximum sustained surface winds of less than 17 m/s are called tropical depressions. Find more informations about tropical storms at the NOAA/AOML Hurricane Research Division. 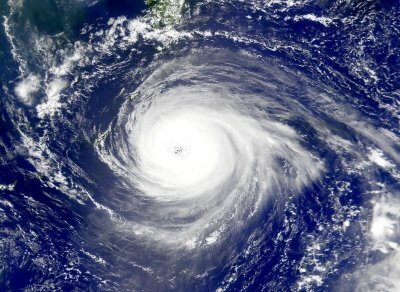 SeaWIFS discerns the eye of Typhoon Jelawat near the island of Minami Daito Jima, Japan (07/08/00). 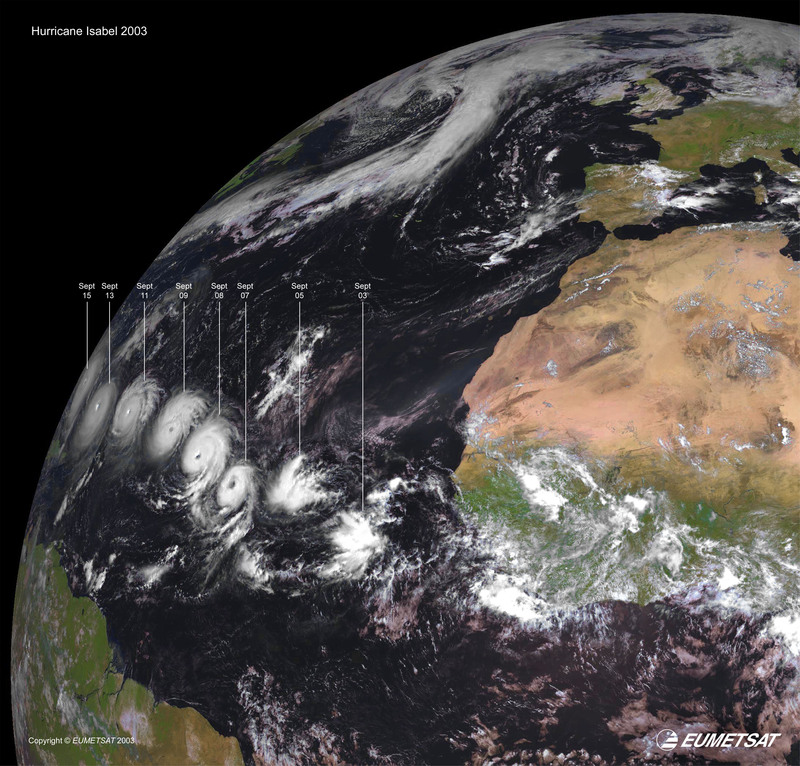 This composite image shows the development of Hurricane Isabel as monitored by Meteosat-8 in September 2003. 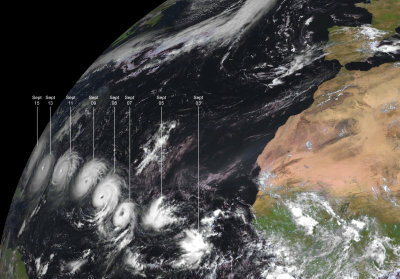 Source: EUMETSAT. 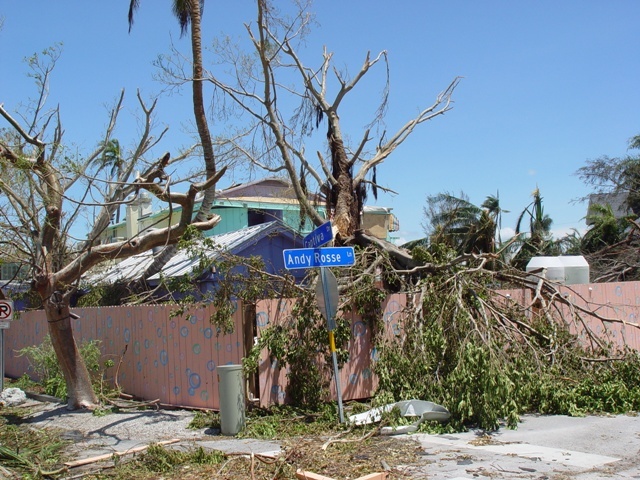 Damage from Hurricane Charley on Captiva Island, Florida. Photo: NOAA/Tampa Bay National Weather Service. 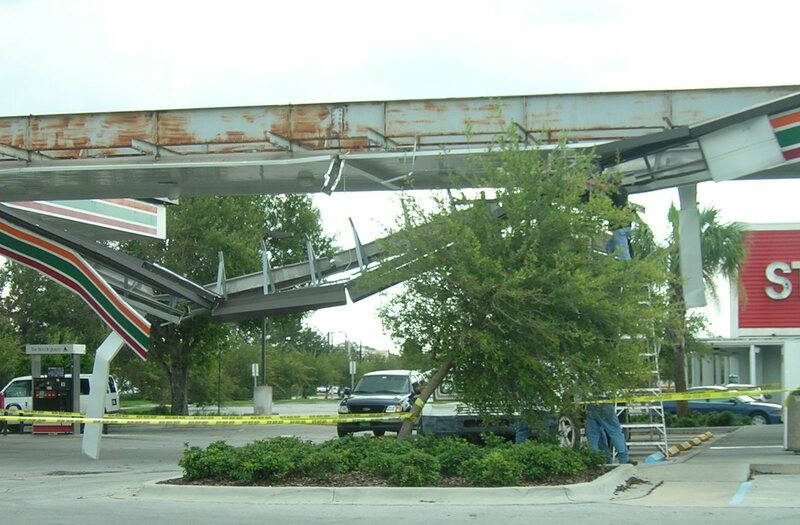 Damage caused to a gas station in Kissimmee, Florida, by Hurricane Charley. Photo: Wikipedia. Charley lasted from August 9 to 15, 2004. At its peak intensity it attained 240 km/h winds, making it a strong Category 4 hurricane on the Saffir-Simpson Hurricane Scale. 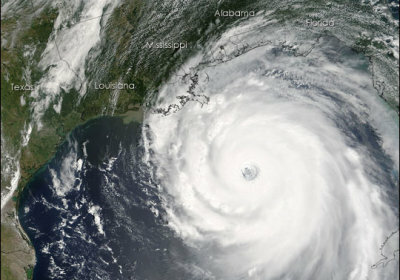 Charley was the strongest hurricane to hit the United States since Andrew in 1992. 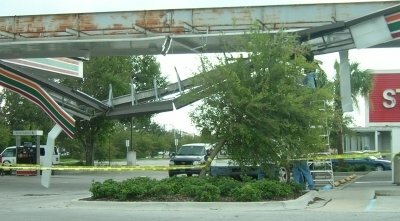 Although small in size, it caused catastrophic wind damage. Arrival of hurricane Katrina in Mississipi. Photo: Anonymous. 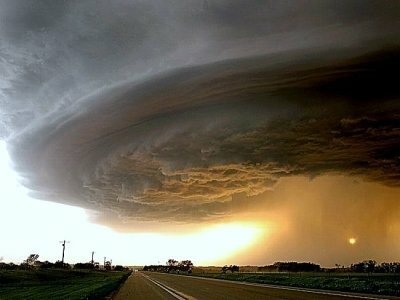 Hurricane Katrina was one of the costliest, deadliest and strongest hurricanes ever recorded in the history of the USA. The hurricane formed over the Bahamas and crossed southern Florida as a moderate Category 1 hurricane before strengthening rapidly in the Gulf of Mexico. 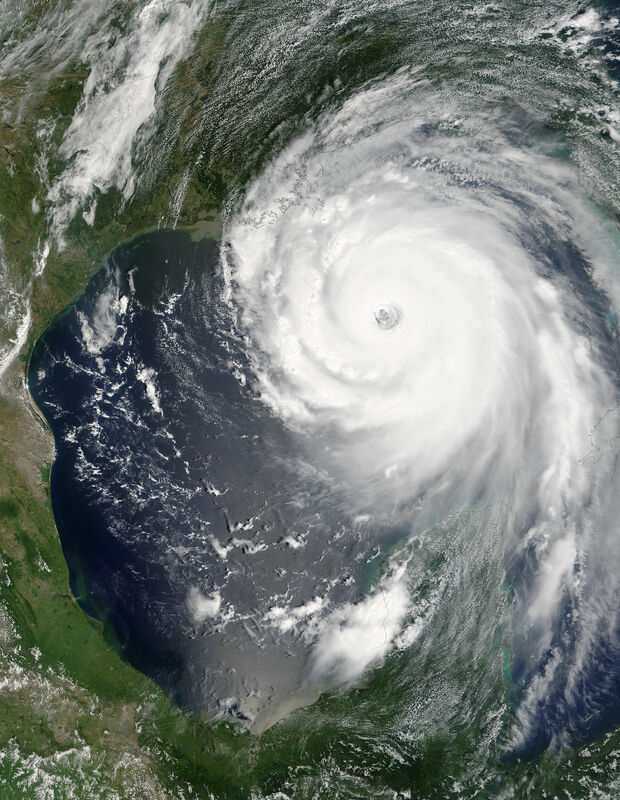 It stroke Louisiana as a Category 3 storm on August 29, 2005. It caused severe destruction along the Gulf coast from central Florida to Texas, much of it due to the storm surge. The most severe loss of life and property damage occurred in New Orleans (Louisiana) which flooded as the levee system catastrophically failed, leaving 80% of the city flooded. About 2000 people lost their lives in the actual hurricane and in the subsequent floods. The storm is estimated to have been responsible for $81.2 billion in damage. Three years later, in 2008, thousands of displaced residents in Mississippi and Louisiana were still living in trailers. For more informations visit the page " Hurricane alert" of the EOEdu website. Hurricane Katrina as seen by MODIS onboard Terra on the 28th of August 2005. Source: MODIS Rapid Response Team, GSFC/NASA.